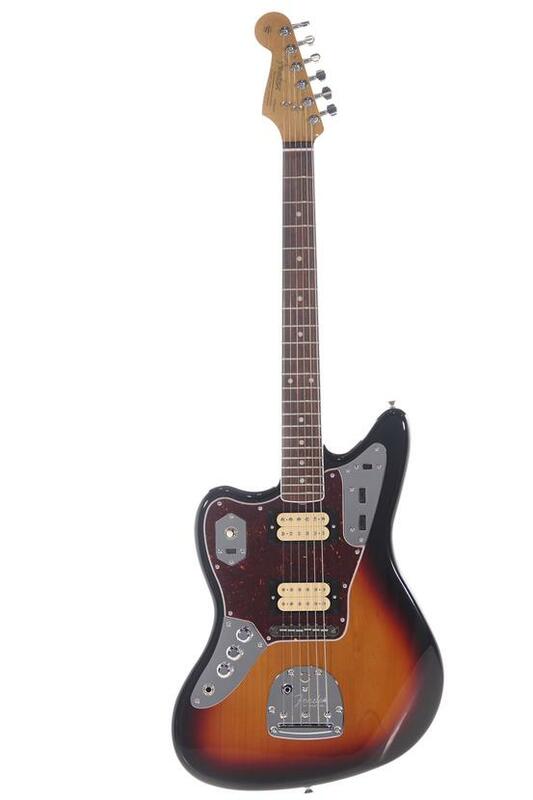 One of Fender’s® most distinctive signature models ever is the Kurt Cobain Jaguar™-meticulously modeled on the battered and highly unusual 1965 Jaguar that Cobain wielded during the heady early-’90s..
DEMO STOCK - Instrument is in excellent, as new condition and has not been played or used for any purpose likely to cause wear or condition variation. Instrument has been removed from its factory packaging strictly of display purposes. This instrument has been assessed as being in excellent working order but may show superficial and or barely noticeable imperfections as a result of the manufacturing process. This guitar includes a Tremolo Arm and a Hard case. Fender® introduces one of its most distinctive signature models ever, the Kurt Cobain Jaguar®–meticulously modeled on the battered and highly unusual 1965 Jaguar that Cobain wielded during the heady early–’90s era when Nirvana ruled rock and led a musically stunning and culturally subversive movement. Fender craftsmen have reproduced Cobain’s battle–hardened left–handed Jaguar down to the last unusual detail, including its worn finish, dual humbucking pickups and unique electronics and controls (which were already in place when Kurt acquired the guitar in summer 1991). Unique features include an alder body with Road Worn aged finish and hardware treatment, bound fretboard with pearloid dot markers, Stratocaster headstock shape with 1950s–style “spaghetti” logo, DiMarzio® humbucking DP103 PAF 36th Anniversary neck pickup and DP100 Super Distortion bridge pickup, triple knurled “chrome–dome” knob configuration (volume-volume-tone), three-position toggle switch, black chrome Adjusto-Matic™ bridge and Gotoh® sealed tuners.